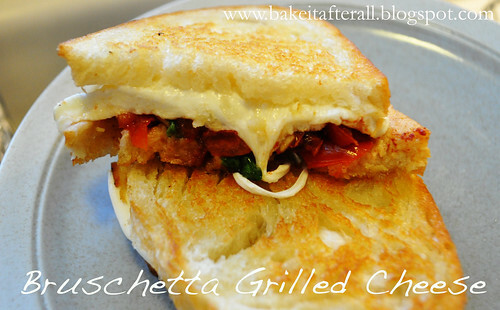 There are many versions of Caprese Grilled Cheese out there, where you sandwich fresh mozzarella, tomato, and basil between 2 slices of bread, but I decided to use my favorite bruschetta mixture instead. This sandwich reminded me of the Tomato & Mozzarella Panini that Panera used to serve (although it is no longer on the menu!!) I loved that sandwich and was thrilled to make a version at home. Initially I used butter for the bread like a typical grilled cheese, but Bob and I agreed that olive oil works better in fitting with the bruschetta aspect. This sandwich was a little tricky to flip so I troubleshooted it and came up with a way to avoid flipping the sandwich - grilling each piece of bread separately and only flipping the cheese side when the cheese has started to melt and adhere to the bread. The result is one of our new favorite dinners! 1. Combine fresh and sun-dried tomatoes, garlic, olive oil, vinegar, basil, salt and pepper in a medium bowl and set aside for 10 minutes. 2. Drizzle slices of bread with olive oil on one side and use a pastry brush to distribute evenly. 3. Place one slide of bread, oil side down, in a sauté or pancake pan that has been heated to medium. Add slices of mozzarella to the top of this slice. 4. After the cheese slice has cooked for about a minute, add the second slice of bread to the pan, oil side down. 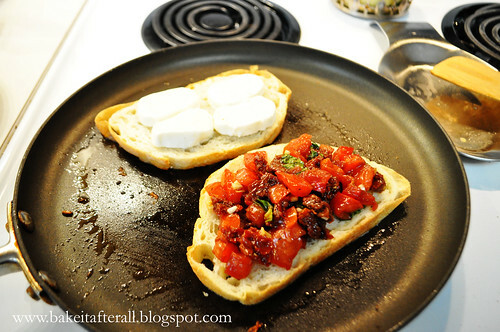 Top with bruschetta mixture (use slotted spoon to avoid transferring too much liquid). 5. 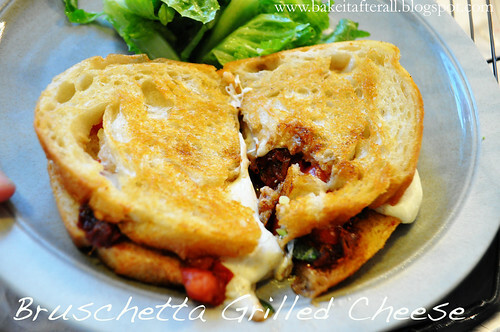 Once the cheese has started to melt and that slice of bread is golden, flip this slice over on top of the bread with the bruschetta on it to make a sandwich. Continue to grill until cheese is melty bread is golden and toasty. These look really good. Serve them to AS the next time I come for a play date.